You have this wish thats out of reach. You try meditation mindfulness, affirmations... you try planning, praying, wishing...you try healers and gurus. Yet still this thing never comes to fruition. You ask yourself why? Why can't I make this happen? What is wrong with me? I deserve this! No matter what you do it won't happen. Then one day you say " Well I guess this isn't in the cards for me" You turn your back and move on. And just around the corner there it is. Just when you resolve yourself to move on. The path of least resistance. Just let it happen. You can't make anything happen. That would put you in the place of resistance. In order to manifest there can not be any resistance. Which means there must be gratitude for where you are right this minute. If you are in gratitude for where you are right now you are in a state of allowing. And, you are positively attracting. This place of allowing is also known as Law of Attraction. What is law of attraction? Ever hear the saying " The worse it gets and worse it gets" or "The better it gets the better it gets" That is law of attraction. 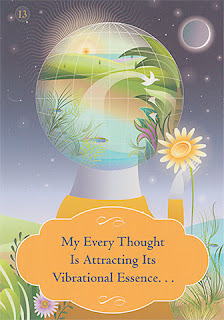 Law of attraction isn't just saying ok I'm going to think good thoughts and attract this or that. It is actually living what you want. Ahhh, easier said than done. So lets start with words. As Don Miguel Ruiz teaches in the The Four Agreements. "Be impeccable with your word". If you have negative vibrations in your words you will attract people and relationships that will vibrate at that same frequency. Gossiping is a great way to get exactly what you don't want. So lets take it a step further. Your thoughts must match that which you are wanting to attract. Being mindful of of the broken record player in your head. When you start going over and over in your head worries and thoughts that don't serve you, it is like praying for something you don't want. This brings us back to being in gratitude. If you are being challenged with thoughts of worry. Try to remember to think thoughts of gratitude. Find something no matter how small and focus on that. When a person concentrates putting attention on the possibilities, they are vibrating at the same frequency of that thing that that they are wanting. If that thing is positive and more is wanted, then your are on the right track. If that thing is negative then you are going to attract more of what you don't want. So how can you actually manifest that which you don't already have. When you are in the vortex of creativity and manifestation manifesting what you do want can be instantaneous. But you have to be in gratitude for what you want before you have it. That means being ok with the process. So here is a little story. I had a friend, and every time I saw her and asked how are you she would respond with a big smile and say "I'm great!" I knew she wasn't great. She had health problems, was out of work and was having a hard time in life. But she never complained. I on the other hand had my health and had a job. Not one I wanted at the time but I had one. And I had a tendency to complain. I could never understand how she could be so positive and yet seem to be struggling. Then one day I asked her. Her response, "You get what you ask for. Eventually the universe hears you and it comes" Her life apparently was much worse before I met her. She eventually resolved her health problems, got a great job and started traveling. I can say that this may sound trivial or unremarkable but this is a good example of how we can attract what we want by living as if we are already there and being grateful for the journey. Much of what happens in our lives, happen because we needed to learn a lesson. Be thankful for those lessons. We need them to grow and evolve. It takes time to develop this skill. Don't give up.